There are many complex parts to trigonometry and we aren't going there. We are going to limit ourselves to the very basics which are used in the study of airplanes. If you understand the idea of ratios, one variable divided by another variable, you should be able to understand this page. It contains nothing more than definitions. The words are a bit strange, but the ideas are very powerful as you will see. We define the side of the triangle opposite from the right angle to be the hypotenuse. It is the longest side of the three sides of the right triangle. The word "hypotenuse" comes from two Greek words meaning "to stretch", since this is the longest side. We label the hypotenuse with the symbol h. There is a side opposite the angle c which we label o for "opposite". The remaining side we label a for "adjacent". The angle c is formed by the intersection of the hypotenuse h and the adjacent side a. We are interested in the relations between the sides and the angles of the right triangle. While the length of any one side of a right triangle is completely arbitrary, the ratio of the sides of a right triangle all depend only on the value of the angle "c". We illustrate this fact at the bottom of this page. Let us start with some definitions. We will call the ratio of the opposite side of a right triangle to the hypotenuse the sine and give it the symbol sin. The ratio of the adjacent side of a right triangle to the hypotenuse is called the cosine and given the symbol cos. Finally, the ratio of the opposite side to the adjacent side is called the tangent and given the symbol tan. The ratio of the opposite to the hypotenuse is .967 and defined to be the sine of the angle c = 75.5 degrees. Now suppose we incline the 8 foot ladder so that its base is 4 feet from the wall. As shown on the figure, the ladder is now inclined at a lower angle than in the first example. The angle is 60 degrees, and the ratio of the adjacent to the hypotenuse is now 4/8 = .5 . Decreasing the angle c increases the cosine of the angle because the hypotenuse is fixed and the adjacent increases as the angle decreases. If we incline the 8 foot ladder so that its base is 6 feet from the wall, the angle decreases to about 41.4 degrees and the ratio increases to 6/8, which is .75. As you can see, for every angle, there is a unique point on the ground that the 8 foot ladder touches, and it is the same point every time we set the ladder to that angle. Mathematicians call this situation a function. The ratio of the adjacent side to the hypotenuse is a function of the angle c, so we can write the symbol as cos(c) = value. 90 - c is the magnitude of angle d. That is why we call the ratio of the adjacent and the hypotenuse the "co-sine" of the angle. Since the sine, cosine, and tangent are all functions of the angle "c", we can determine (measure) the ratios once and produce tables of the values of the sine, cosine, and tangent for various values of "c". Later, if we know the value of an angle in a right triangle, the tables tells us the ratio of the sides of the triangle. If we know the length of any one side, we can solve for the length of the other sides. Or if we know the ratio of any two sides of a right triangle, we can find the value of the angle between the sides. We can use the tables to solve problems. Some examples of problems involving triangles and angles include the descent of a glider, the torque on a hinge, the operation of the Wright brothers' lift and drag balances, and determining the lift to drag ratio for an aircraft. 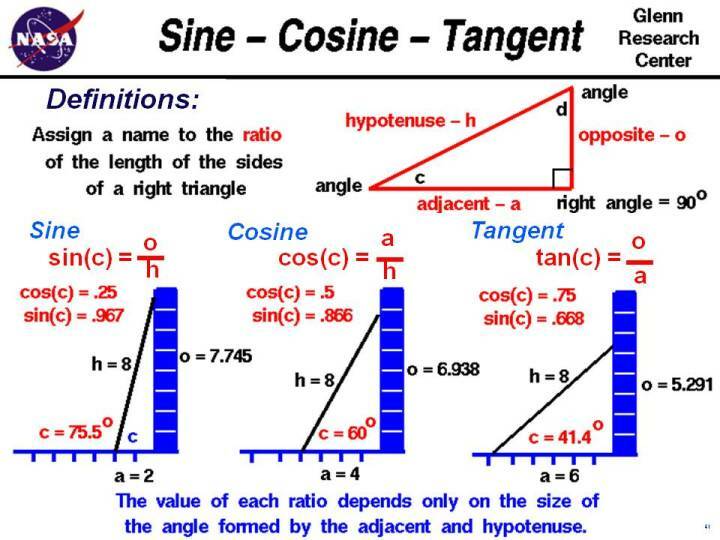 Here are tables of the sine, cosine, and tangent which you can use to solve problems.